T-cells play an important role in the body’s immune system and one of their tasks is to find and destroy infection. However, T-cells struggle to identify solid, cancerous tumors in the body. A current cancer therapy is using these T-cells and genetically engineering them to kill cancer, but these cells, known as CAR-T cells, have been known to attack off-target sites while completing their job. In order to counteract this negative effect, Notre Dame researchers are working to create nanoparticles that act as an “on and off” switch to improve the safety and effectiveness of this cancer therapy. This research is being led by Prakash D. Nallathamby, research assistant professor of aerospace and mechanical engineering and affiliated member of NDnano, specifically to target breast cancer, which is the second leading cause of cancer-related deaths among women. 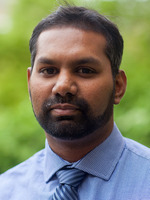 At Notre Dame, Nallathamby works to promote the use of nanoparticle-enabled technologies, and his research focuses on the synthesis of nanomaterials, biomedical imaging, cancer biology, and targeted therapeutics and diagnostic tools. 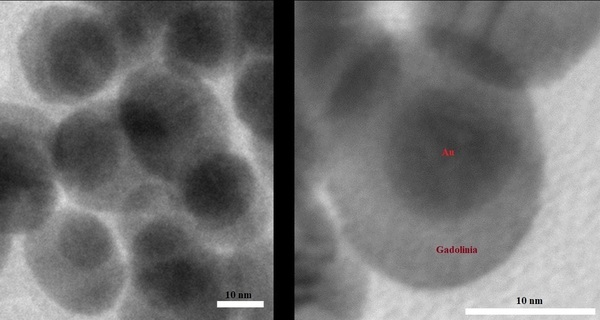 Images of the two-faced nanoparticle Professor Nallathamby and his team have developed. For this project, Nallathamby’s research team will use a specific type of CAR-T cells and make it so those cells will deactivate after the cancerous tumor has been eliminated. To accomplish this, the researchers are developing a double-sided nanoparticle that has an architecture designed for one part to bind to the surface of a tumor while the other part can capture and activate the CAR-T cells. Beyond adding an on and off function, the research team will also aim to improve upon the traditional CAR-T cell therapy by using universal CAR-T (uCAR-T) cells. Currently, CAR-T cells are made by removing T-cells from a specific patient and then genetically engineering them to target solid tumors. However, this process takes approximately 30 days to complete before administering treatment. Since uCAR-T cells are not derived from individual patients, they will be more readily available. Although this research targets breast cancer tumors, it has the potential to be applicable to other cancers that cause solid tumors to form. Additional collaborators on this research include Lance Hellman, research assistant professor of chemistry and biochemistry and affiliated member of the Harper Cancer Research Institute (HCRI), and Paul Helquist, professor of chemistry and biochemistry and affiliated member of HCRI. The project is funded by an initiation grant through the Notre Dame Research Faculty Research Support Program. This grant program was created to provide seed funding to established faculty initiating new programs of research, scholarship, or creative endeavor. To learn more about the grant program, application requirements, and past recipients, please visit https://research.nd.edu/our-services/funding-opportunities/faculty/internal-grants-programs/faculty-research-support-program—-initiation-grant/. Originally published by Brandi Klingerman at research.nd.edu on August 15, 2018.